It has been wisely pointed out that, “If you are full of an answer, you have no space for questions.” Some of our old answers may not serve us so well any more, and we may need to let go of them if we are to create space for new answers. Our beliefs are a very powerful impact on our behavior. It is common knowledge that if someone really believes s/he can do something s/he will do it, and if s/he believes something is impossible no amount of effort will convince them otherwise. Not surprising then, that our beliefs about ourselves and what is possible in the world around us greatly impact our day-to-day effectiveness. Times of transition and crisis highlight this even more strongly. The beliefs and stories that we and others hold during an unstable or crucial time determine just how resourceful we can be. The more limiting beliefs, the less resourceful. Empowering beliefs help us to identify and take best advantage of potential opportunities, while limiting beliefs focus us on danger and can trap us into old survival strategies like attack, retreat or freeze. Not surprising then that Robert Dilts talks about “thought viruses.” Such “thought viruses” can “infect” our minds just as a physical virus can infect our bodies or a computer virus can infect a computer system. In all three cases the result is the same – all sorts of unwelcome malfunctions. So is it time for an upgrade? You don’t have to be some eager early adopter of computer software to know that this is a good idea every so often. The same applies to the software between your ears. Many of our beliefs were developed through parents, teachers, social upbringing or media exposure before we were aware of their impact or able to consciously choose them. Good news, then, that we can unlearn, change and restructure old beliefs that may be limiting us. We can also develop new ones that expand our potential beyond what we currently imagine possible. If you want to know how to do this for yourself or others see you on the ITS NLP Master Practitioner Programme. Robert Dilts, Founder of NLPU in Santa Cruz and leading NLP author and developer, will be demonstrating how and making available his latest work during the ITS NLP Master Practitioner Programme. He’ll be demonstrating specific techniques to convert limiting beliefs and thought viruses to beliefs which make possible confidence in a positive future, a sense of personal capability and responsibility, and a sense of self-worth and belonging. 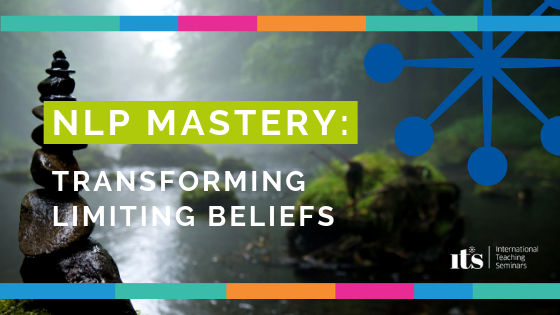 This training will explore how to build and strengthen empowering beliefs, identify and transform limiting beliefs, and facilitate positive change in ourselves and those around us.